Welcome, and thank you for visiting! If you are looking for an experienced craftsman to restore your clock, watch, music box, or singing bird cage, I would be pleased to help you. 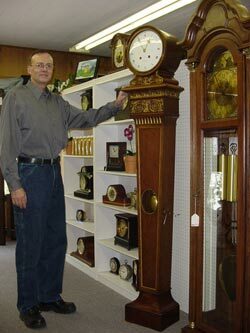 I am horologist Peter Schryver, and for more than 35 years I have enjoyed repairing, appraising, literally thousands of new and antique time pieces for our local community, and surrounding counties. Many items I have repaired over the years are family heirlooms, and have great sentimental value to their owners. I respect this very much, and it brings me great satisfaction to see the smiles on my customers faces when they see and hear them working properly again! Some examples include wooden works tall case clocks by Riley Whiting, Eli Terry Pillar & Scroll, Ornate French marble clocks with visible escapements, Hand carved cuckoo clocks, Weight driven Williard and Howard banjo clocks, Og's, Pillar & Splat, Triple deckers. Handmade English fusse pocket watches circa 1700's. 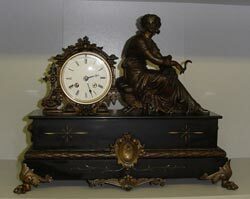 Grandfather, Mantle, Wall hanging, Anniversary, Swiss Atmos, French Provincial, the list just goes on and on! What began as a childhood hobby, has transitioned into a life long career for me. I take great pride in my craft, providing fine quality, guaranteed service. A purest approach toward repairs is implemented in order to preserve the historical significance, and monetary value of each timepiece.